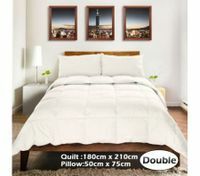 Online shopping in Australia for quilts and comforters? Our crazy deals mean you don't have to look any further! There's something about quilts that evoke feelings of warmth and happy memories of home. Imagine those warm winters wrapped up in the warm quilts and how you didn't want to get out of bed because the comforter you had was just so comfortable. The warmth and comfort makes these quilts and comforters a necessity. At CrazySales we offer different types of quilts, duvets and other beddings from the best and most recognised brands in Australia. These soft and fluffy doona quilts and comforters of varying sizes and thickness is so much more than just a simple bedding accessory. Here you can find Manchester beddings and sets of the highest quality at the best possible prices. Since CrazySales knows that comforters and quilts are very much a part of every bedroom, we bring together the best packages of quilts and comforters. For children, it is ideal to purchase the smaller sized ones - a single quilt or double quilt will be just right for a smaller bed. On the other hand, queen size quilt or king size quilt is best for couples who are using a larger bed. Queen and King Size quilts are also the standard sizes used in most hotels and bed and breakfasts. What are you waiting for, shop for quilts or comforters on sale today at CrazySales. Be sure to catch our latest clearouts on quilts and comforters! We buy our products right from the manufacturer to pass the deals direct to all our customers. If you buy quilts and comforters at CrazySales, you'll get the lowest price on top name products. We use fast, low-priced delivery to get your order to you. If you're not completely ecstatic with your quilts and comforters, then just return them to us within 30 days for full store credit. Become one of over half a million happy customers at CrazySales, Australia's fastest growing online shopping site. With our secure online shopping technology, you can buy online safely. And with our CrazyPoints shopping reward system you get more discounts the more you buy!